Posted on June 25, 2016 by Sofie L.
The Sose Bay area on the Danish island of Bornholm is a beautiful place. Here, the lush greens of the partly forested coastline with its white sandy beaches meets the Baltic Sea, and at the horizon there is nothing but sky. Early Jurassic rocks crop out along the coast; the sands and clays still soft after 200 million years, revealing a multitude of sedimentary structures when scraped free of their weathered surfaces. The most continuous sedimentary succession in the coastal cliff is exposed east of Sose Odde. It comprises a c. 24 m thick section including restricted marine, eustarine, lacustrine and fluvial deposits, and was described in detail by Surlyk et al. (1995). The outcropping succession belongs to the Sose Bugt Member of the Rønne Formation, which was assigned a Hettangian–Sinemurian (Early Jurassic) age based on its fossil palynological (spores, pollen, microalgae) content. In 2014, Clemmensen et al. described the presence of steep-walled, flat- to concave-bottomed depressions, with a raised ridge at each side, that were interpreted as dinosaur tracks. The dinosaur tracks are found in layers interpreted to have been deposited in small streams on a large coastal plain. Clemmensen et al. (2014) suggest that the dinosaurs may have preferred to use shallow channels as paths. The succession also contains thin coal seams and layers penetrated by numerous vertical roots, remnants of 200 million year old vegetation. Numerous thin vertical roots penetrating a thick sand layer (Photo: Sofie Lindström, GEUS). So these are the sediments that lie immediately beneath our feet when we walk the fields at Sose Bay, below a thin cover of Quaternary sediments. But what lies beneath? Would sediments deposited before, during and after the end-Triassic mass extinction be present? The drill site and equipment (Photo: Gunver K. Pedersen, GEUS). In order to find out, we performed a core drilling in the Sose Bay area, with the aim to reach typical red and green coloured Late Triassic sediments – and hopefully Triassic–Jurassic boundary sediments.We drilled with a core drilling technique that sealed the sedimentary cores in plastic pipes. The core catcher brings up a new core (Photo: Gunver K- Pedersen, GEUS). John Boserup checkes the bottom of a core (Photo: Gunver K. Pedersen, GEUS). By checking the bottom of each pipe when they were brought to the surface, it was possible to see when the red and green Triassic had been reached. At a depth of 110 m below ground, we reached red Triassic sediments. Red and green clay and some sand at the bottom of a core (Photo: Gunver K. Pedersen, GEUS). But because the cores were sealed in red plastic pipes, we still had no idea how complete the drilled succession would be. All we could do was wait until the cores had been transported back to GEUS. Sealed red plastic pipes containing the cored succession of the Sose-1 well (Photo: Gunver K. Pedersen, GEUS). Posted on November 6, 2013 by Sofie L.
Last week I attended the Geological Society of America (GSA) annual meeting and 125th anniversary which was held at the Colorado Convention Center in Denver, Colorado, USA – A multitude of scientific sessions and thousands of geoscientists! As always with large conferences, it is both fantastic and confusing to have so many interesting sessions presented almost simultaneously. 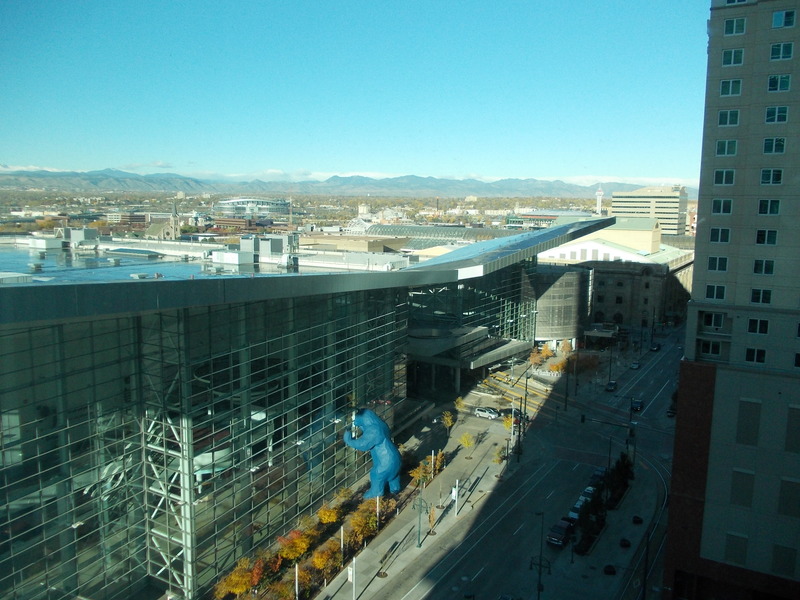 The Colorado Convention Center in Denver with its Blue Bear and the Rockies in the background (view from my hotel window at the Regency Hyatt; Photo: S. Lindström). I participated in the session T238. New insights into Triassic-Jurassic Transition events and end-Triassic Mass Extinction (blue text are links to program and abstracts). This session was graciously hosted by Rowan C. Martindale and Morgan F. Schaller who had put together an interesting programme bringing forth some of the latest research and ideas concerning TJ-boundary research. We who participated got to hear interesting talks on the carbon cycle, specifically on Late Triassic pCO2 variations by Morgan Schaller et al. and on Late Triassic ocean stability and orbital control by Sylvain Richoz et al. The pedogenic carbonate results of Schaller et al.’s research suggest a long-time (30-million-years) fall in the atmospheric CO2-content from the Carnian to the late Rhaetian prior to the eruption of the Central Atlantic Magmatic Province (CAMP). Richoz et al., on the otherhand, demonstrate a relatively stable marine C-isotope curve from the Norian to the Rhaetian, displaying only a gentle decrease, i.e. possibly an on-going input of light carbon to the atmosphere (increased CO2) during the Late Triassic prior to CAMP eruption. Regarding the plant record, Wolfram Kürschner presented some new data indicating environmental mutagenesis in Late Triassic conifers in more equatorial areas, where a sudden size increase in Classopollis pollen may be due to whole genome doubling (polyploidy) as a consequence of environmental stress. Karen Bacon talked about the fact that many present-day plants get thicker leaves when subjected to increased levels of CO2, and especially if exposed to low O2 at the same time, and put this in relation to findings in the plant records across the TJ-boundary in East Greenland. In one of the solicited talks, Jennifer McElwain presented an extensive review of her and her co-workers palaeobotanical research on the TJ-boundary of East Greenland over the last 25 years. The impact of her research did however, receive some criticism from the next solicited speaker Spencer Lucas who meant that not only is there no palaeobotanical evidence for a global or even regional mass extinction at the end of the Triassic, but not for the terrestrial terapods either! But then Lucas did not seem to acknowledge the palynological support for a floral mass extinction. His critique does emphasize that there is a need of more thorough palaeobotanical work across the TJ-boundary from other parts of the world. Lucas also presented major criticism on the impact of the cyclostratigraphic scheme for the Newark Basin, which he said had caused “a decade-long miscorrelation” with other TJ-boundary succession. This led to a slightly heated discussion between Lucas and the next speaker, Paul Olsen, one of the researchers behind the Newark Basin cyclostratigraphy. In his talk, Paul Olsen discussed the impact a volcanic winter due to SO2-degassing from the CAMP would have on terrestrial vertebrates. After a short break it was finally my turn. My talk, entitled “Supraregional seismites in Triassic – Jurassic boundary strata“, presented widespread evidence of episodic seismic activity in NW Europe during the end-Triassic mass extinction interval. My co-authors and I have found evidence of at least four separate seismic events in the form of soft-sediment deformations within TJ-boundary successions from Sweden, Denmark and Germany, and the implications of these on the CAMP and the end-Triassic mass extinction where discussed during the talk, which was going as scheduled when it was interrupted by a ca 5 minute long false fire alarm. Eventually I could continue and finish my talk but unfortunately with no time for questions. One of the most interesting talks was that on the Cotham Marble where Yadira Ibarra et al. showed that the calcified microbial mats, containing prasinophycean algal cysts (Tasmanites) and a sparse shelly fauna, must have formed in a calcium carbonate supersaturated environment. The Cotham Marble is synchronous to the so called initial C-isotope excursion. Kathleen Rittersbuch et al. presented new data on earliest Jurassic siliceous sponge dominance based on fieldwork in the Peruvian Andes. Correlations with siliceous sponge records in Nevada, the Austrian Alps and Morocco indicate that this was a globally relevant phenomena. Aviv Bachan and Jonathan Payne presented modeling of hypothesized carbon cycle perturbation scenarios for the TJ-boundary, focusing on the large positive C-isotope excursion (CIE) following the sharp negative CIE. They found that the modelled scenario most similar to the recorded C-isotope record is that with temporary increase in pCO2 coincident with the volatile release, as well as a temporary decrease in carbonate saturation, indicating that the release of volatiles during the emplacement of the Central Atlantic Magmatic Province could have been the driver of the environmental perturbation. The final talk of the session was that of Bas van de Schootbrugge et al. who presented our palynological reworking data that indicate increased weathering and erosion, i.e. mass-wasting, synchronous to the terrestrial deforestation during the end-Triassic mass extinction. The massive reworking registered in both Germany, Denmark and Sweden, emphasizes the severity of the environmental impact on the land environment, and it seems likely that increased input of sediment, soil and organic matter to the ocean must have played a part in the extinction scenario. Posted on June 6, 2012 by Sofie L.
It actually started 16 years ago when Gerald R. Dickens and his colleagues published their paper on oceanic methane hydrate dissociation and the Palaeocene-Eocene Thermal Maximum (PETM). Their hypothesis that release of methane gas stored in oceanic sediments was the cause of the negative carbon-isotope excursion at the end of the Palaeocene and hence the trigger of the global warming recorded at the PETM, got scientists working on climate change and mass extinction around the world to suddenly set their old theories aside and focus on this new one. 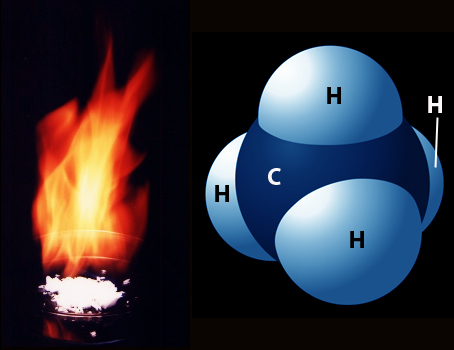 Burning natural gas which consists of methane to 80% (Left) and a methane molecule (right). Today, it seems, everybody’s talking about methane, CH4, this very potent greenhouse gas. From methane stored in clathrates underneath the ocean floor, or frozen by permafrost in the circum- Arctic or Antarctic tundra ( e.g. De Conti et al. 2012), to cattle or even farting dinosaurs during the Mesozoic, it poses a severe threat to life on Earth if released in large quantities. Hence, many scientific papers (see e.g. Payne et al. 2004 and references therein, and Ruhl et al. 2011) have argued that methane must have played a role in the end-Permian and end-Triassic mass extinctions, which are both associated with negative carbon-isotope excursions indicating input of light carbon (carbondioxide or methane from volcanoes or other sources). You can read our paper (or just the abstract) or the press release. Posted on February 3, 2012 by Sofie L.
A feature/focus article by Timothy M. Lenton et al. on how the expansion of terrestrial vegetation in the Late Ordovician ca 440 million years ago cooled the atmosphere and triggered the growth of ice sheets. A review article by Gibling & Davies on how the development of terrestrial vegetation changed the fluvial style of rivers and shaped the landscapes over a 250 million year period, from the Cambrian to the carboniferous. As well as a selection of papers from the archives, amongst which are two articles dealing with the Triassic/Jurassic boundary, namely the paper by Belcher et al. (2010) on charcoal and wildfires in the T/J boundary record of Greenland, and a News and views story by Bas van de Schootbrugge (2010) discussing that very subject. "What would life be without plants?" Posted on December 22, 2011 by Sofie L.
Our X-mas tree this year is an Abies nordmanniana (Steven) Spach, one very much like the one on the photo below. As a palaeontologist specialized in the Late Palaeozoic to Early Mesozoic I would of course have loved a Wollemia nobilis or the Wollemi pine as a X-mas tree, but it is on the endangered species list. The Wollemi pine, which probably evolved in the Early Cretaceous, some 110 million years ago, is an araucariacean conifer that was believed extinct until it was discovered growing in some remote sandstone gorges some 150 km northwest of Sydney, Australia. But Abies nordmanniana is not on the endagered species list, and so it is a much better choice for a X-mas tree. It is native to the Caucasus, Armenia and areas around the Black Sea. Abies nordmanniana probably evolved from an ancestral Mediterranean form during the Pliocene, i.e. between2.6 and 5.3 million years ago (Linares, 2011). Hence, geologically speaking my X-mas tree is a fairly young species. I have never worked with the Pliocene, but it was an interesting time period. Due to a combination of global cooling and drying grasslands and savannas spread enormously during the Pliocene, creating new environments where long-legged grazing mammals, the ancestors of e.g. zebras and antilopes, could evolve. During the Pliocene North and South America connected through the Panamanian land-bridge, and allowed interchange of species between two continents that had been separated for a long time. This eventually lead to the extinction of most of the South American marsupials and native ungulates. So in fact, the Pliocene was quite a dramatic period.